Maybe you're a momma who wasn't able to bring your baby earthside. Perhaps your heart has been carrying around questions about their brief time with you. Maybe you want the chance to find more understanding of this difficult situation or would love a little more peace from their perspective. I've had the profound honor of helping mommas heal their hearts from this unique reading. These readings are pretty concise and so they aren't very long. These spirits are to the point with me. And you will not find my own interpretation inside of them either. I channel what comes through and that is what you receive. I won't make something up that isn't there nor add my own voice to what is already perfect. If something is vague to me and they won't clarify, I fully trust you know what to do with the information OR it will come to you in some form. Was there something I could've done differently? How would you like us to honor and remember your life? What lesson is there for me in all of this? Anything that comes to your heart is a great question to ask! For this reading, you'll submit your questions at check-out OR you can opt to email them to me within 3 days. I'll connect with your little one shortly thereafter and then send you a PDF printable keepsake of your questions and their responses. So no worries about scheduling time zones or disturbing your evening! Easy-peasy! With so much love, xo. 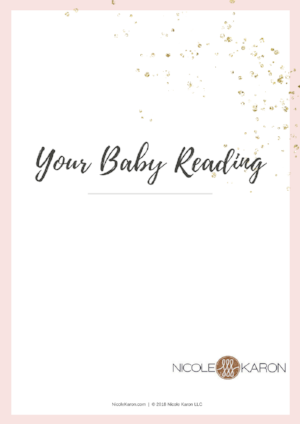 Order your reading here to deepen your relationship and more fully support your baby's journey!